United Nations humanitarian agencies on Thursday called for more donor funding to reverse a 25 per cent reduction in food or cash assistance for more than 100,000 refugees in Rwanda. “We thank donors for their continued generosity and support, while urging them to further fund humanitarian assistance so that we can give refugees the assistance they depend on,” said Jean-Pierre de Margerie, Rwanda Country Director of the World Food Programme (WFP). Some 130,000 Burundian and Congolese refugees in Rwandan camps rely on humanitarian assistance. Full rations of nutrition support for refugees provide 2,100 calories per person per day, the minimum for a healthy life. However, funding shortages forced WFP to trim assistance to 90 per cent in November and December, and since January, WFP has reduced the ration sizes to 75 per cent. Some $11 million are needed to restore full support for the next six months. For its part, the Office of the UN High Commissioner for Refugees (UNHCR) had secured only 19 per cent of its total funding needs as of December 2017. UNHCR, WFP and others have started moving towards targeting to ensure the needs of the most vulnerable are considered, while continuing supplementary feeding and promoting self-reliance by supporting a Government pledge to 'graduate' 18,000 camp-based refugees from food and/or cash for food assistance programmes by mid-2018. “Now more than ever is the time to find innovative and long-term solutions for refugees in Rwanda,” said UNHCR Representative Ahmed Baba Fall. A Government-UN joint strategy on economic inclusion of refugees enables more refugees to become self-reliant and contribute to the economic development of their host communities by creating access to formal employment opportunities for up to 60,000 refugees and providing banking services for a similar number of refugees by mid-2018. 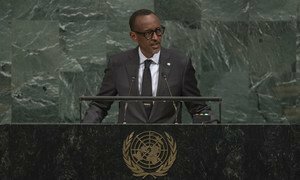 The United Nations must treat all people with impartiality and respect, and be a good steward of the funds entrusted to it, the President of Rwanda today said in his annual address to the General Assembly debate in New York, adding his country’s support to the spirit of reform taking root at the Organization.